Rockwell Transmission & Parts in Stock Low Prices Worldwide Shipping. Rockwell Transmissions New, Used and Factory Re-Manufactured Exchange. All models in stock and ready for immediate shipping or delivery worldwide to your door. We sell all 9, 10 and 13 speed Rockwell transmission models & offer rebuilt units, parts, rebuild kits, gears and repairs. We can rebuild G platform transmissions and any other truck transmission model for less. Low priced delivery and free core return shipping! Call our experienced Rockwell technicians and we will find the correct model transmission you need and get it to you fast at a price you can afford. 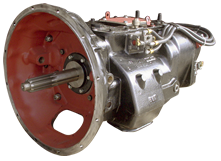 We can ship any Rockwell transmission model to any city in the world. We are one of the largest re-builders and repair parts distributors of Rockwell transmissions in the World for a reason, we do it right and save you money! We have hundreds of transmission in our warehouses all across the US and stock genuine Rockwell transmission parts like: bearings and kits, gasket & seal kits, gears, shafts, shift forks and cases. We also have a full line of after-market Rockwell Transmission & Differential repair parts for the budget minded. We supply all Rockwell 9, 10 and 13 speed units at discount prices. Our distribution centers all over the United Stated have in stock, the full line of Rockwell transmissions ready for pickup or delivery worldwide.